I feel as though the last 10 posts have been devoted entirely to desserts. This is probably not true but close to it.You can tell that I have a sweet tooth, can’t you? I thought that I would not only get back to food of the savory variety, but a basic staple. 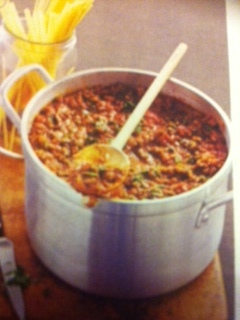 I have been making a Bolognaise Sauce for years but found this recipe only 7 years ago. Sometimes I stick to it and other times I experiment a bit. Every cook would have their own variation on this, but if you haven’t or you just want to try something different then go for it!